Studex Sensitive hypoallergenic surgical steel butterfly stud earrings. The 8mm butterfly design is inset with four crystals. These earrings come with surgical steel butterfly backs. These are my daughters second pair of earrings, we put these in when we took out the pair she had her ears pierced with. She loves them & they have been complimented many times. I thought my daughter was only able to wear gold earrings until I can across these. 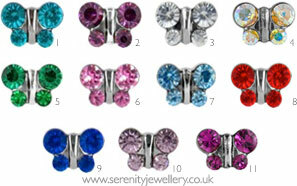 These are of piercing quality with the larger butterfly backs and don't irritate. Brilliant for a girl who wanted some cool earrings with sensitive ears!! the butterfly earrings are bigger then i thought thay will be, the color is beautiful, and the service of SERENITY JEWELLERY is EXCELLENT, thank you again! Gorgeous little earrings, very good quality. Perfect for my daughters 12th Birthday! The earrings look nice and are fairly solid- however the backs went through my daughters ear while she was sleeping- causing significant pain and distress. We’re so sorry to hear that. It’s rare and very unlucky for earring backs to get stuck like that but is a reminder for everyone to please be careful when children are wearing earrings with butterfly backs at night. If they are too tight as that’s when these things are more likely to happen.